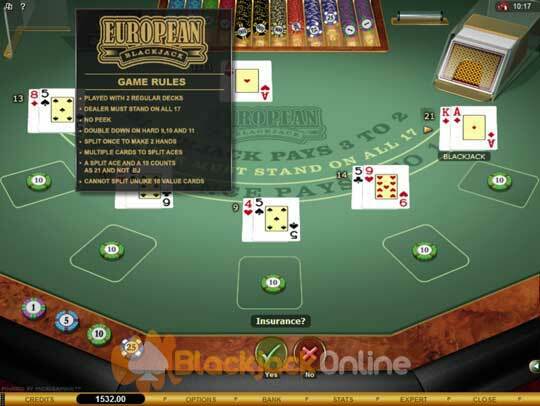 The game of European Blackjack is available to play in many different formats at Microgaming powered casinos. You can play it as a stand alone single hand game or multi hand variants are also on offer. 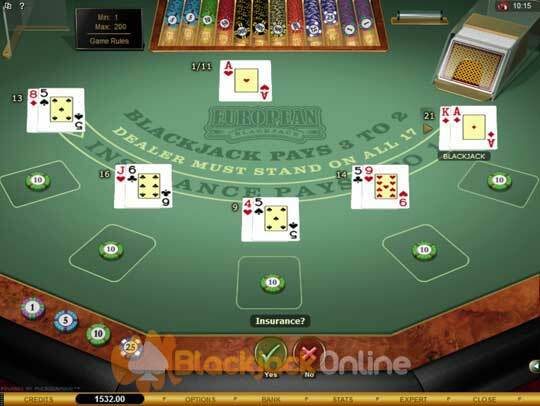 However many additional Blackjack variants also use the European game as the base game, these include the games of Hi Low 13 Blackjack, High Streak Blackjack and also the Perfect Pairs Blackjack game. The house edge of Microgamings excellent European Blackjack game is 0.42%. We have put together several handy European Blackjack playing tips below, along with the game play rules. You can also download our own European Blackjack Strategy Card (see below) which shows you how to play perfectly strategy when playing this Blackjack variant. Playing a Pair of Nines - Getting dealt a pair of 9’s is quite straight forward, always split them when the dealers card showing is a 2 to 6, 8 or 9 valued card, if it isn’t then and he is holding a 7, 10 or Ace then you need to Stand your hand. Splitting a Pair of Sixes - You should always split a pair of sixes should you have been dealt such a hand, however, this is not the case if the dealers up card is a 7 to Ace valued card, in such instances the correct strategy is for you to hit those hands. Insurance Wager - You will be offered Insurance on your base game wager when the dealer could be holding a Blackjack hand. However, you are strongly advised not to place such wagers, as the house edge on offer on this separate wager is large and offers very poor value. Hitting a Soft 18 – When you have been dealt a soft 18 hand, then always stand this hand, the only time you should do otherwise and hit this hand is when the dealers up facing card is showing a nine, ten or an Ace. Dealer Rules - The dealer will shuffle the 2 card deck before a new game is set into play. All 17 valued hands either soft or hard or any higher valued hand dealt to the dealer will result in him standing that hand. Player Rules - Whenever a player has any hard nine, ten or eleven hand he may double down that hand. Splitting a hand is allowed, however, be aware you can only ever split a hand once, and unlike other variants when you have split a pair of Aces you can be dealt multiple cards to them. You will only be able to split matching ten valued cards and not unalike ten valued card! Payouts - The standard payouts are awarded to winning hands on the European Blackjack game at Microgaming software powered casinos, and as such you will get 3 to 2 for a winning Blackjack hand, even money is paid for all other winning hands, this includes split Aces which have been dealt a ten valued card. All winning Insurance wagers are paid at 2 to 1.